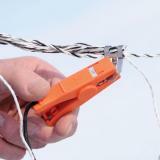 For instant in-the-field connections. 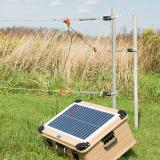 It's an easy way to gain entry to an electric fence without turning off the energizer. Our farm vehicles always carry several because we never know when or where we might need to fix or connect a fence. Use with netting and conductors. Use for instant in-the-field connections. The PowerLink connection allows electricity to flow to both conductors. 2 lengths: 30" and 48"
Easy way to connect two hot wires. 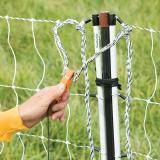 Quick way to gain entry to a electric fence without turning the energizer off. Squeeze handles of one alligator clip to open jaws, then let metal "teeth" snap closed onto non-electrified conductor or netting. Release handle. 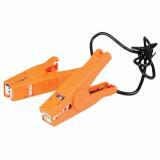 With other alligator clip, squeeze the plastic handles to open jaws, then let metal teeth snap closed onto the electrified conductor or netting. Release handle. Number of reviews: 51 customers reviewed this product. Recommended: 46 out of 51 said they would recommend this product to a friend. Each farm vehicle has a set or two of PowerLinks riding along with it because we find them so useful. They make for a quick fence connection and since we’re always moving netting around on the farms these have become an essential part of our grazing operation. They grip thicker conductors very well and are just easy to have on hand. For some folks the metal contact points don’t have enough teeth for smaller insulators… Read More » (MaxiShock and IntelliTwine) but they work for us. These are great! Will buy again. 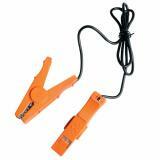 I use these for jumper wires on my paddock system they work great. The ones I use to use would shock you through the clamp these don't. Makes connecting roll sections easy. Love it. I love these, we run a hot wire at the top of our sheep & goat fencing. 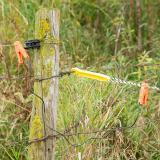 With the Powerlink we are able to connect our electric netting to the hot wire whenever we graze near the perimeter fencing. Always handy to have a couple of these ready.